The traditional land of the MOUHENEENA people encompassed the area from New Norfolk, Hobart and down to Margate (North West Bay). Their land included Mt Wellington and inland approximately 20-30 kms from the Derwent River. Signs of the MOUHENEENA people still abound the shores of the Derwent and D’Entrecasteaux Channel. Shell middens represent the locations where the people camped, made small fires and cooked a rich variety of shellfish. Occasionally, you might see isolated stone tools (artifacts) in bush land surrounding Hobart. The stone artifacts were fashioned by the men for use as cutting tools or scrapers. Stone tools were traded from one end of Tasmania to the other. Complex and very strict trade negotiations occurred between different language groups and successful trade negotiations resulted in celebrations (Corroboree) by the groups. While there are scant historical records of what happened to the MOUHENEENA people, the invasion of their lands by the English would have contributed to their demise. What is left for the current and future generations of Tasmanians’ is the knowledge that as you walk across these lands you should remember and have respect for the original custodians of this land, the MOUHENEENA people. During the late nineteenth and early twentieth centuries, the Domain was planted with exotic and native trees, quarries were rehabilitated and a vast parkland was created with more manicured gardens with the botanical gardens and later the Beaumaris Zoo. Much of the Domain’s natural environment is white-gum grasslands and bushland now dotted with a variety of introduced trees both exotic and native. 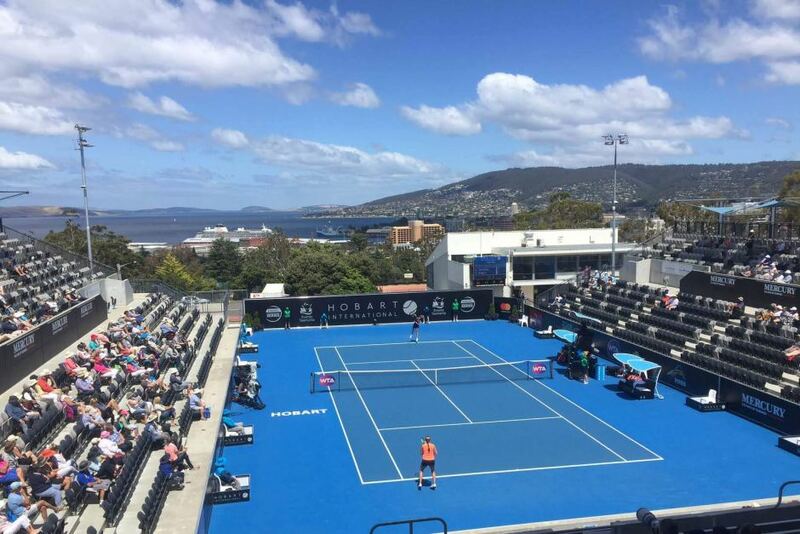 The Domain is not only a dominating physical feature in central Hobart, it is a focus for a vast range of sporting, recreational and commemorative activity. For residents of the Glebe and inner suburbs, it was for many a big backyard and huge playground for children in the days before television. It has also been a centre for visiting circuses as well as political discussion, a tent site for the poor during the Great Depression, a venue for schools sports and other activity. The Domain is now ringed with highways that separate it from the city however there are many easy points of access to this large and varied landscape. View of H.M. Victoria Magazine from the courtyard. The Domain powder magazine, was first built as a double roofed, solid sandstone building, with "vaulted" inner brick ceilings, by the Royal Engineers in 1850-51 and was capable of storing 1600 whole barrels of powder. In 1857 another totally separate bay was added. It remained as Hobart’s main gunpowder storage until 1970. To overcome the danger from sparks, the only metals used are copper (doors and grills), bronze and brass. In some areas, the floorboards are pegged with wooden dowel. Ventilation is indirect to prevent sparks from bushfires entering the magazine. Two copper conducting rods called "Franklin Rods", (after their inventor, Dr Benjamin Franklin,) protect the building from lightning strikes. These rods run down to two separate water reservoirs to provide safe earthing, a method that was the subject of the first world-wide patent. The small housing in the eastern wall is the old ‘shifting house’ in which casks were opened and gunpowder exchanged. There was a "gunpowder" jetty associated with the Domain "Victoria" magazine for deliveries. The jetty was demolished some time after 1970 and all that remains are the stone abutments at the waters edge beyond the slipways towards Government House. The TCA Grounds. © Events Tasmania and Alastair Bett. This delightful oval was the home of the Tasmanian Cricket Association from 1882 to 1987 when the TCA headquarters moved to Bellerive Oval. In its time, the ground has been home to greyhound racing and local football in various leagues, school sports and large gatherings of all kinds. It is currently used for both club football and cricket. Over the year the ground was host to visiting international and interstate teams and the 1979 Gillette one-day cricket final (won by Tasmania). The main Pavilion and nearby Ladies Stand are fine examples of Victorian grandstands and are heritage listed. Initially established in 1818 by Governor Sorrell, real development began in 1827 under Governor Arthur. It is the second oldest botanic gardens in Australia and still includes many buildings and features from the early years. Arthur’s Wall, dating from 1830, is a hollow wall with ducts for heating to allow cultivation of exotic species and plants. The cats iron gates date from 1878 and a number of buildings date from the 1840s. The gardens have been a popular part of Hobart life for most of their history. Government House. © Tourism Tasmania & Sarajayne Lada. Governor Macquarie selected the site in 1821 for its “agreeable degree of retirement”. The house was not built until 1855-58 when a Victorian Gothic style building was constructed. Once described as the best vice-regal residence “belonging to any British colony’. 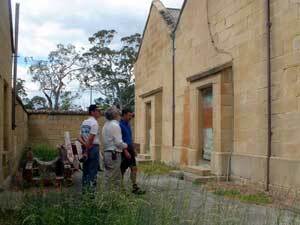 In recent years, an annual open day has been held for the people of Hobart to tour the house and grounds. In 1923 the Hobart City Council acquired a private zoo, Beaumaris Zoo, and moved it to a rehabilitated quarry near Government House. The animals included both Australian and Tasmanian species as well exotics such as lions, monkeys, polar bears and elephants. The last known Tasmanian Tiger (thylacine) died there in 1936. The Zoo was closed in 1937 because of financial problems. From 1943 till 1991, the site included naval fuel tanks, removed after the Hobart City Council purchased the site. The site is now being redeveloped as a wildlife rehabilitation and education centre due to open in 2004. Cenotaph. © Tourism Tasmania & Kathryn Leahy. This was once the site of the Queen’s Battery, dating from the 1840s, one of a network of harbour defence batteries around Hobart with others sited on Bellerive Bluff and above Sandy Bay beach. The area was also used for military exercises (including a rifle range) and drill throughout the colonial period. In 1925 the Cenotaph was constructed from public donations and became the first capital city memorial in Australia. The design was a result of a public competition and it was placed here because of its proximity to the Soldiers Memorial Avenue. The area has been extensively remodelled over the years and the old battery site is no longer visible. The latest addition to the precinct is the Victoria Cross Memorial in memory of the 13 Tasmanians who have won the Victoria Cross. The memorial includes a sound scape and has been constructed using soil from the battlefields of Gallipoli, South Africa, France and Belgium. A row of cedars was planted in 1926 along the city side to connect the Cenotaph area and the Soldiers Memorial Avenue; only two remain and have been dedicated to Alec Campbell and Frank MacDonald MM as the last Tasmanian representatives of all those who served in the Great War. The open areas to each side have been used for sport for many years and a centre for kite flying in Hobart. The Hobart Regatta is the nation’s second oldest and commenced in 1838 and has been very year since bar two. A grandstand was built in 1877 and replaced by eth John Colvin Stand in 1919-20. Since World War II, sideshows have added a carnival aspect to proceedings which include rowing, yachting, power boats and in some years swimming across the Derwent. Originally this was the homeport of colonial Tasmania’s navy and a drill hall was constructed for naval cadets after federation. It served as an important training centre and home dock for a number of small naval vessels until the base was de-commissioned in 1994. The oldest remaining buildings date from 1912-13. This weatherboard structure was built in 1912 to provide a radio communication in support of Douglas Mawson’s Antarctic expedition. It was for many years the transmission station for coastal radio providing communications for all types of mariners in the seas around southern Tasmania. Erected in 1848-49 in a Gothic architectural style as the Hobart High School by local businessmen, it became the site of the University of Tasmania from 1890 until 1963. A number of other buildings were constructed over the years and most became the property of the Education Department and TAFE (which grew out of the old Hobart Technical School). This large brick and stone building was constructed in 1911 as a teacher-training centre after a debate about teaching standards in Tasmania. It is Gothic revival in style to conform to the early university buildings. It remained in use for teacher training until 1972 though since then it has been host to in-service education for teachers and adult education. Its gardens provide a park-like setting and connect it to the Domain proper. The granting of ‘glebes’ dates from an 1836 Act of the British Parliament. Sections of land were granted to the Trinity Anglican parish, the Roman Catholic Church and the Presbyterian Church. The Anglican and Presbyterian sections were progressively developed from the 1880s under 99 year leases; the Roman Catholic Glebe was not really developed until the 1950s (it is the newer section of building on the Glebe at the northern end). Since the sale of freehold from the 1980s onwards, the Glebe has become a ‘high quality’ residential area with many houses renovated and restored. It contains some large stone houses but is dominated by Federation weatherboard dwellings in a wide range of styles. Many of the houses are heritage listed. The area provides fine views over inner Hobart, the harbour and the Wellington range. Originally tennis had been played in the grounds of the TCA until the building of the Domain Tennis Centre in the 1960s. It is in constant use for club competitions and is home to the Tasmanian Women’s Open in January. Over the years this competition has seen international players using the tournament as preparation for the Australian Open held in Melbourne. The Centre was built in 1971 on the site of two small ovals that had been used for cricket and athletics from the period between the wars. 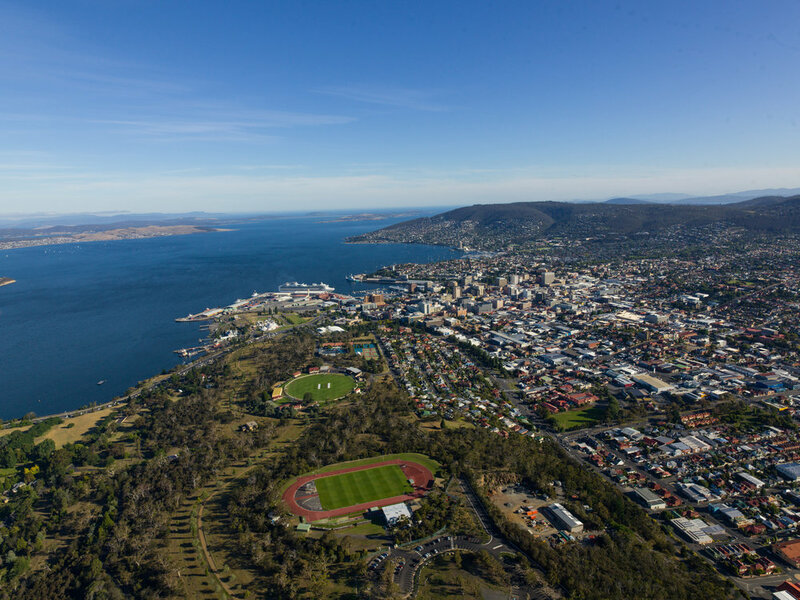 The Centre is the home of most major athletics in Hobart and is the scene for inter-school, interstate competitions as well as a national carnival in January. The site was originally known as the Hollow and was a centre for speeches, political meetings, band concerts and visiting circuses and once hosted a steam carousel. . The amphitheatre shape was the result of quarrying in the nineteenth century. Conifers were planted around it in the 1880s and it quickly became a popular spot for Hobart’s residents. In 1960 the original Hobart pool was built here and replaced by the present Aquatic Centre in 1990. The Centre includes a 50 metre eight-lane competition pool, a 25 metre six lane utility and diving pool, a 25m leisure pool, leisure water with beach entry, spa, sauna, steam room, child care and poolside café. There is also a gymnasium (Fitness Domain). The Centre is open every day except Christmas Day. This 5km cycle path connects regatta Point with Glenorchy. It is used by rollerbladers, cyclist, joggers, strollers and walkers for a smooth and safe passage along the foreshore of the Domain, past Government House and the Botanical Gardens, to Cornelian Bay and then on to New Town and Glenorchy. The timber wharf is the only remaining part of the bulk paper storage built by Australian Newsprint Mills in 1949-50. Huge rolls of paper were brought by barge from Boyer and then trucked to the wharfs for export. The main shed was the largest weatherboard structure in eth Southern Hemisphere. The area is now parkland. The Tasman Bridge. © Events Tasmania and Alastair Bett. The first cross-Derwent bridge, the ‘floating’ bridge, was built in 1943 just north of the Tasman Bridge and the base of the old lift section can be seen. The bridge was prone to storm damage and was replaced in 1963 by the current Tasman Bridge, built to allow easy access to ships going upriver. In 1975, a number of span sections to the eastern side were brought down by the Lake Illawarra resulting in the deaths of 12 people. The bridge was reopened in 1977.